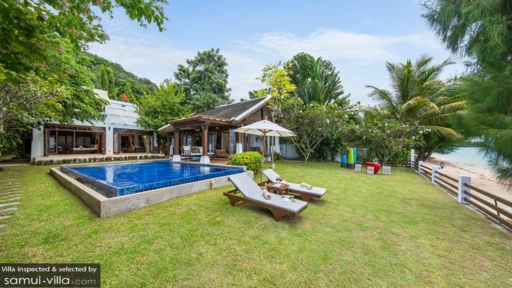 Nestled away in the north of Samui, Bang Po lures villa vacationers with its picture-perfect beaches, air of serenity and lack of bustling tourist crowds. If all of this sounds promising for a restful retreat, it is. In no time, you’ll soak up the relaxed, unhurried pace of the coastal town. Your Bang Po villa was built to facilitate ultimate relaxation. Its idyllic atmosphere sets the stage for a laidback holiday, while a full range of perks - from tremendous sea views, to beautifully landscaped outdoor spaces and impeccable service - ensures an incredible villa experience. 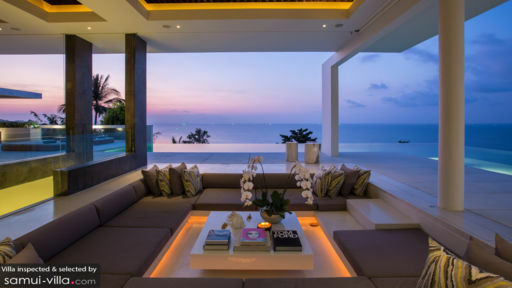 A wide-ranging array of decor styles will suit a variety of needs and preferences; minimalists will enjoy the all-white interior of stylish yet simple villas, while travellers seeking a home dominated by Asian accents will appreciate touches like Thai-style roofs, Buddha statues and outdoor salas. There’s also ultra-luxe vacation rentals boasting cool features like swim-up bars and an outdoor projector for poolside movies - just right for holidaymakers looking to live large. Bang Po Beach, located a skip away from your villa is a favourite hangout among expats. While the coast becomes a narrow strip at high tide, a lack of tourist crowds makes it a great spot for long, quiet walks accompanied by unobstructed views out to Koh Phangan. Stop by the western of the beach; the area is peppered with seafood restaurants dishing out some of the tastiest plates on the island. There’s a small reef set away from the beach if you’re looking to snorkel, although the visibility isn’t great. At the eastern end of the coast lies Ban Tai Beach, a hidden gem that lets travellers enjoy the island’s spectacular coastline without bustling crowds. But you’re not limited to beach activities. Fisherman’s Village, located 20 minutes’ drive away is a haven of shops and high-end dining venues. Six Senses Samui, about 37 minutes’ drive from your villa is our venue of choice for decadent spa rituals, and The Yogarden Samui (19 minutes’ drive) is where expats and vacationers alike stretch it out on a yoga mat. But don’t step out if you don’t feel like it - your villa manager will readily assist with engaging a massage therapist or instructor for in-house spa and yoga sessions. Bang Po draws foodies with its array of seafront, local-style seafood restaurants. While the ambience is casual and unfussy, the food is anything but. Haad Bang Po was named ‘best beach restaurant in the world’ by Travel + Leisure, while Bang Po Seafood Takho has been raved by numerous diners. Other venues worth trying out include: Khanom Jeen Pla Khiao, Khanom Jeen Pa Maitree and Armando’s Beach Restaurant. Stop by 4 Monkeys Coffee Bar for some of the best coffee on the island. A family-friendly travel itinerary will likely include visits to the iconic Big Buddha, Samui Cultural Center, Secret Buddha Garden, Laem Sor Pagoda and Hin Ta and Hin Ya Rocks. These attractions are between 20 to 40 minutes’ drive away, and your villa manager will assist with driver and car hire. Vacationers looking to spice things up with late night parties will enjoy the boisterous nightlife scene of Chaweng Beach (33 minutes’ drive).